As a marketing strategist I refer to the Customer Lifecycle fairly frequently. Most of the time clients have no idea what I am talking about and give the look. You know the look - it's the slightly quizzical mostly bemused look that says "whatever you say marketing geek'. So here are the answers to 5 common questions about the customer lifecycle and why it matters (and not just to marketing geeks). 1. What is the Customer Lifecycle? It sounds technical, theoretical and inapplicable. The customer lifecycle is just a fancy way of showing how people buy. It doesn't matter if it is a candy bar or enterprise software, when we buy something we go through a series of behaviors that is largely the same. While the chart below shows the customer lifecycle as linear it is important to remember that in the real world the buying process is very rarely linear. It also might appear that each phase or step in the process is a conscious and considered step. This also isn't always the case. For instance for the purchase of a candy bar you can get through the Consider and Expand stages in a blink of an eye. You move from Find to Purchase without a whole lot conscious thought. That being said you probably did examine the choices available to you, create a consideration set (nothing with coconut for instance), expand your decision (ohhh nougat) and make the choice. Realistically this isn't your first candy bar either so to some extent all of this took place in the Grow stage but let's not over-complicate things. 2. Did you come up with this? Well, I would love to take the credit but no. The idea of the customer lifecycle has been around for a long time and in different versions. Sometimes it is referred to as the Purchase Lifecycle or the Buying Lifecycle. I modify it for different purposes and have added my own spin but I stand on the shoulders of giants. 3. Ok so why should I care? Right. Well you should care because you want to make getting from Find to Purchase pain-free for your prospects. You want to be easy to buy from while at the same time thought of as being crazy smart about your industry and very helpful. The more you understand about how your customers buy, the better you can serve them. You may also want to be able to change the message, tone, urgency and offers leading up to making a purchase. This makes for better leads and happier customers. 4. How do I use it for my marketing efforts? When planning your marketing activities you want to have touch points for prospects and customers at each stage. Too often B2B marketing is developed assuming all buyers are at the same stage. Content creation should line up with your Customer Lifecycle stages to ensure you are meeting the needs of prospective buyers wherever they are in their purchase decision process. Take for instance 2 prospects who have visited your website. Prospect A could be getting ready to recommend 3 providers to their management and only needs pricing to make their choice. They are in the Expand stage. Another prospect may be just starting to investigate options and wants to better understand how you solve their business' problem. The need to find you and be aware you offer a relevant and credible solution to their issues. Each of these prospects requires different information (marketing) from you and neither is ready to buy - but they will be in the future. You can use the customer lifecycle to understand what content is needed for nurturing a prospect and you can determine how close to making a purchase decision they are by the content they consume. 5. So, will getting this concept generate leads? Not exactly. Simply knowing won’t generate leads but apllying it will. 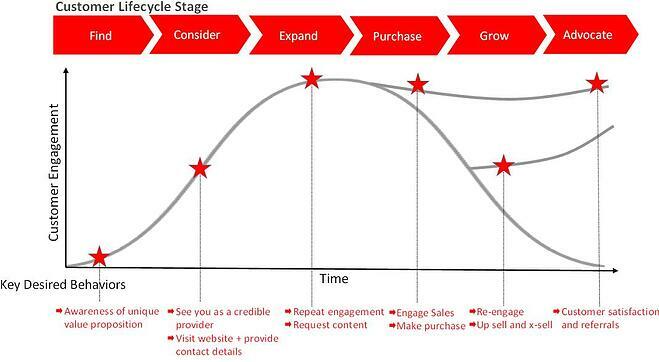 Understanding your customer's lifecycle will allow you to be able to create more relevant marketing content. Relevance is important for generating leads because prospects will only spend time getting to know you if they think you have something to say to them. You don’t want to miss any opportunity to have a marketing conversation with a prospect because you weren’t able to talk about issues related to their lifecycle stage. There you go - five questions and answers. We have only scratched the surface with regards to the customer lifecycle so feel free to post your questions in the comments. I promise to answer every one.